Catering to you with flavor, service, and expertise. Linn's Restaurant has proudly served the San Luis Obispo County since 1994 with a welcoming and relaxed dining experience. We look forward to bringing all the things you enjoy most about our restaurant to your next event. Whether it's a small gathering, a business event, or wedding, Linn's can meet your needs. We pride ourselves on catering to the unique character of our clients while creating an unforgettable experience for your guests. We work to ensure your event reflects your own taste and brings your vision to reality. Our goal is to relieve you of the many details that go along with hosting a successful party so that you and your guests can thoroughly enjoy your special event. Linn's provides exceptional handmade foods, bartenders, and servers to make the most of your experience. 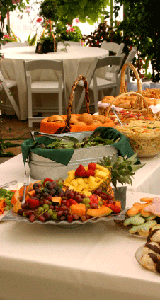 Click here to see our current Catering Menu, Trays, Appetizers, Soups, Sides, and Desserts. Contact catering director Renee Linn for an appointment or for more information: e-mail: renee@linnsfruitbin.com or call: 1-805-927-1499. Need a wedding or special event cake? Click here.